An increasing trend these days is for game publishers to release a fully updated with DLC "complete" edition of their games several months after the initial release. Bad for people that buy new games and DLC or season passes at launch, but good for people with a bit of patience since you can get the full game plus DLC a year or less after the initial launch. While most of these complete editions are great deals, they aren't all created equally. We take a look at the best and worst right here. Usually, they are titled "Ultimate" or "Game of the Year" (they only have to win 1 GOTY award, no matter how small, to claim this title by the way) or "Complete" Edition. They usually come with all of the DLC that was released as well. The Xbox One has seen a new surge in so-called "Definitive Editions" that are HD re-releases of last-gen games. Some are great. Some, not so great. We'll include the best and worst of these below as well. Fallout 3: Game of the Year Edition - Includes all 5 of the DLC packs. The definitive version of the game. Fallout New Vegas: Ultimate Edition - Includes the 4 DLC packs, plus Courier's Stash and Gun Runner's Arsenal weapon packs. Grand Theft Auto IV & Episodes From Liberty City: The Complete Edition - Includes the full GTAIV experience and two major Episodes from Liberty City expansions. There is also a separate Episodes from Liberty City disc available, but it doesn't include the base GTAIV game - just the expansions (which are playable by themselves). Keep that in mind before you buy. Red Dead Redemption: Game of the Year Edition - Includes the full Red Dead Redemption game, all of the multiplayer DLC, and the Undead Nightmare expansion. Definitely the best version of the game to buy. Midnight Club Los Angeles: Complete Edition - This one is noteworthy because the Platinum Hits version of Midnight Club LA is the complete edition and may not be advertised as being "complete." Just look for the Platinum Hits version, and it'll be the right one. Includes full core game plus South Central expansion. LA Noire Complete Edition - More modestly advertised than most complete editions, will only have a little "The Complete Edition" towards the top of the box to differentiate it from the normal version. Includes extra outfits, additional cases, and a badge collection challenge. Saints Row The Third: The Full Package - Includes core game plus all of the DLC missions (Genki Bowl, The Trouble With Clones, Gangstas In Space) along with additional characters (Cheapy D, Penthouse Pets), costumes, and more. Well worth it. Borderlands Game of the Year - Includes full Borderlands 1 game, plus all 4 expansions. Originally released with the DLC as download tokens, newer versions have the DLC on a disc instead. Be wary of buying a used version that used the download tokens, since they likely have already been used and can't be used again. Better to buy the version with DLC on disc. The Elder Scrolls IV: Oblivion: Game of the Year Edition - Only includes Knights of the Nine and Shivering Isles expansions with the full core game, but none of the other premium DLC released for the game. Not a bad deal, considering that these expansions are massive, but keep in mind it isn't the 100% complete game. Batman: Arkham Asylum Game of the Year Edition - Includes full game along with extra challenge missions as well as a 3D visual mode. Also noteworthy because, unlike most "Complete Editions", it uses a separate save from the vanilla version of the game, so you can play through it again and get all of the achievements again. Batman: Arkham City Game of the Year Edition - Includes full core game along with all of the DLC including pre-order skins and challenges. Also has the worst box art in the history of video games. Resident Evil 5 Gold Edition - Includes full RE5 game plus two additional missions, expanded Mercenaries mode, additional costumes, and online versus mode. Mortal Kombat: Komplete Edition - Full game plus 4 additional DLC characters and classic costumes and fatalities for certain characters. Forza Motorsport 3 Ultimate - This platinum hits version of Forza 3 includes all of the DLC plus the core game at a great price. Tomb Raider: Definitive Edition - (XONE) The best version of a great game. Includes multiplayer DLC. 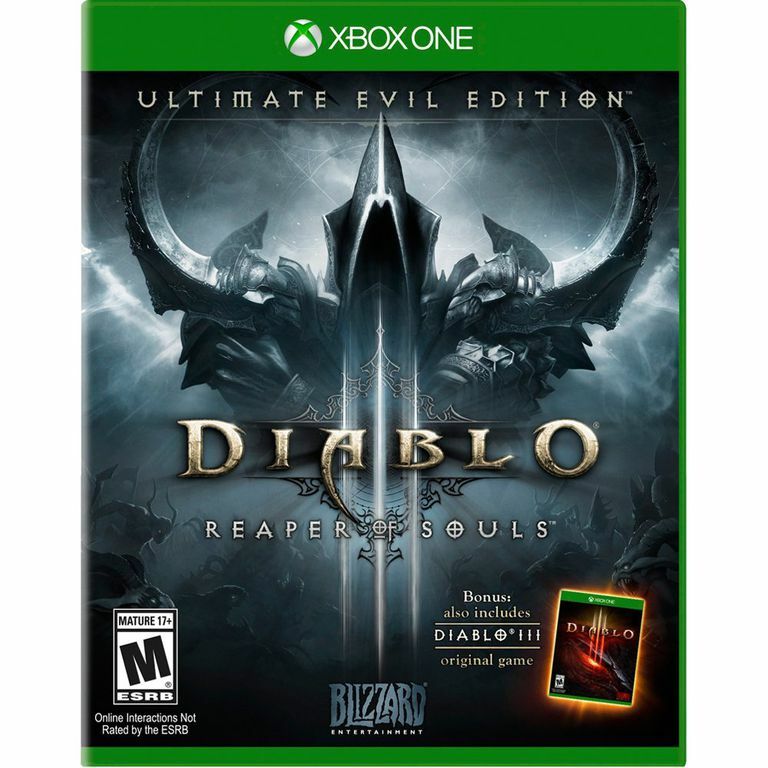 Diablo III Ultimate Evil Edition - (XONE) Vast improvement in visuals plus tons of new content. There are also some less than stellar "Game of the Year" editions and combo packs that you'd think would be good deals, but really aren't. Forza 4 Essentials Edition - Unlike the fantastic Forza 3 rerelease, Forza 4's new version a year after release not only doesn't include any DLC, it was actually a stripped down version of the game with a ton of features from the core game missing. It will tempt you with its cheapness, but it isn't worth it. Call of Duty 4 Game of the Year Edition - The initial run of this release did have map packs included with it. Most copies of this version you'll find on shelves, however, don't have anything beyond the core game. Fallout 3 / Oblivion Double Pack - Two great games in one package! Neither of them has any DLC included whatsoever, though. Not a good deal. Mass Effect Trilogy - All three Mass Effect games (see our reviews for Mass Effect 1, 2, and 3 here) in one nice box set. None of the games have any of the DLC included, however, so for the full experience you'll have to pay another $65 or so for the DLC packs. That said, if you've never played the series, this is obviously the best deal for the games. Sleeping Dogs Definitive Edition - XONE - Not a huge graphical upgrade and performance is significantly worse. Does include all DLC and expansions, though.